Getting help to turn your garden from jungle to oasis is less difficult and much less expensive than you might think. 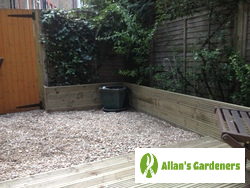 Book our garden design service in Cricklewood NW2 and you’ll find experts that can take your ideas and turn them into a reality for a very affordable rate. As well as improving the look and value of your property, a well designed outdoor space will give you the perfect place to relax and a safe place for your children to play. So whether you lack the time or simply don’t know where to start, you can rely on us to do a great job, and leave you with a garden to be proud of. Call today for more details and get your free, no-obligation quote. 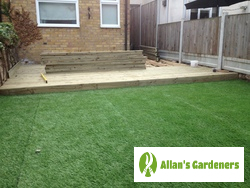 Allan's Cricklewood NW2 garden landscapers will arrive on the day of your appointment on time, equipped with all of the tools needed to get the job done and eager to begin work. They’ll take into account your thoughts and will create a plan that uses every inch of space to its best advantage. Whether you want something low maintenance, a specific theme, a garden to delight the senses, or a safe area for your children to enjoy, they’ll have the ideas and designs to make it work. You’re hiring multi-skilled garden landscapers who not only cater to Cricklewood NW2 but also… Kennington, Guildford, Wimbledon, Bromley, Croydon.